Solid and spacious villa with big pl ot of land and nice location just 5 km away from the biggest city in north-west Bulgaria - Vratsa. 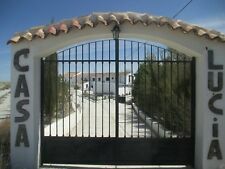 The property is located in a villa zone in the outskirts of the city. Unique property of good size directly on the water in the Swedish Lapland. Then a large garage with a huge adjoining barn with hay loft and many entrances. There is also the main barn building which is traditionally constructed of logs and really is huge and a master peace. The village is very picturesque, it is close to Yantra and Danube Rivers and the area is popular for fishing. - 10 km from the area where Yantra River flows into Danube River. - 20 km from the town of Byala (Ruse area). Traditional Spanish farmhouse converted to two dwellings. The main house has a tiled entrance hallway leading to a lounge, dining room and kitchen. There are 6 bedrooms - 4 with en-suite shower rooms and a main bathroom. PANORAMIC SEA VIEW HOUSE WITH LAND / PROPERTY FOR SALE IN BULGARIA, NR BEACH. The real estate provides 164m2 of living area spread over two floors. The ground floor comprises of a corridor, a living with a kitchen and a fireplace, a verandah, covered barbeque area and a toilette. Detached house 125m2, land area 450m2 the house is surrounded by garden, 3 bedrooms, living room, kitchen, large bathroom, underground room with internal (hatch with stairs) and external entrance (its own door) can be done aν extra bedroom or storage etc, open garage,closed garage, a big kitchen with storage room, an outside storage room of about 15sqm with built-in oven, a living room, autonomous heating radiator, a nice fireplace, air conditioners, a comfortable kitchen, large rooms and areas. HOUSE / PROPERTY WITH PRIVATE POOL FOR SALE IN BULGARIA,10min DRIVR TO BEACH. You can choose whether to swim in your own swimming pool or at the sea, as the beach is only 3 km away, and only 9 km away is the beach of Sunny Beach, the most popular Bulgarian seaside resort. This house has everything you need for a year-round living, and the maintenance team takes care of the owners' needs. 2-BEDROOM LUXURY APARTMENT FOR SALE IN POMORIE ON THE FRONT LINE TO THE BEACH. It is close to the centre of the town and only 15 mins from Bourgas Airport. Beauty parlour. The Sunset Resort is a short drive from the popular resort of Sunny Beach and the ancient town of Nessebar. It consists of a big sized and light room, which compresses a living room and dining room, a toilet, a separated kitchenette, two separate bedrooms, a bathroom / toilet and two good sized balconies. All the furniture and electrics as per photographs are new and included in the price and ready to move in or rent out. HOUSE WITH LAND / PROPERTY FOR SALE IN BULGARIA. 4miles TO THE NEAREST BEACH. The real estate has been built in 2012 and provides 116sq. m of living area, conveniently distributed between a porch, a corridor, a shower room with toilette, two bedroom, open plan living room ( with french doors leading on to a covered veranda) with a kitchen, a fireplace and an on-suite bedroom (with access to the veranda). HOUSE WITH LAND / PROPERTY FOR SALE IN BULGARIA. 15min TO COASTAL TOWN KAVARNA. The main town of General Toshevo is on 15 min drive, while the coastal town of Kavarna is on easy 20 min drive. City of Dobrich is on 40 min drive. It takes approx an hour drive to reach Varna international airport and the city. There are also a restaurant and supermarket. The complex is gated and combines modern facilities and exceptional service. It’s situated about 4km away from the charming beaches of Sunny Beach. The most modern and luxurious complex of the Bulgarian Riviera - Sunny Beach, is located 30 km north of the second largest city on the Black Sea coast – Bourgas. Pamporovo ski resort is located in the heart of the Rhodopi mountain. Pamporovo is the sunniest Bulgarian mountain resort. The average air temperature is - 3 °C. The ski slopes of Pamporovo are safe guarded and maintained in a very good condition. Solid concrete house. There is a large hallway, dining room with kitchen, a bedroom and a bathroom on the first floor. A large bedroom on the atticfloor. The house has two balconies on the first floor and on the attic floor. TWO BEDROOM SEA VIEW APARTMENT FOR SALE NEAR SUNNY BEACH RESORT, BULGARIA! From the living room there is access to the panoramic terrace with a beautiful view of the sea and the mountains. BREXIT TO BULGARIA! Both bedrooms have their own bathroom, equipped with shower cabins. The area is quiet and safe with foreign citizens living permanently there. The property is an hour drive from Varna International airport. - 30 km to the beach in Balchik. The property is for sale furnished with All new electrics and plumbing, PVC double glazed windows and doors with fly screen fitted to all, fully insulated and with central heating run by log burning fire. This is the largest house in the village which is central to large towns and cities and with asphalt access all year round. 3rd floor - 110m2 of open space which is the living room with breathtaking views of the village and the Balkans. 1-BEDROOM APARTMENT 56 sq.m FOR SALE IN SUNNY BEACH RESORT,BULGARIA! The complex is gated and combines modern facilities and exceptional service. It’s situated about 4km away from the charming beaches of Sunny Beach. It consists of a big sized and bright room, which compresses kitchenette, dining and living area, shower / toilet, a separated bedroom and big sized balcony. LARGE DETACHED HOUSE ON THREE FLOORS LOCATED NEAR TO PORT HERSONISSOS ON THE NORTH COAST OF CRETE GREECE. Upper floor has one large double bedroom and two single bedroom and large fully tiled bathroom with shower over bath, toilet, and washbasin. This contemporary villa is constructed to an excellent standard, distributed in 4 double bedrooms, 4 bathrooms (3 en-suite and 1 family bathroom), open plan design with high ceilings and natural stone features. 50 km from Balchik and the seacoast. The house is for sale furnished and ready to use. All windows are double glazed PVC, but are temporary covered with wooden boards. The house is very good value for money. 30% OFF THE PRICE! STYLISH 1-BED APARTMENT FOR SALE IN SUNNY BEACH, BULGARIA! It consists of a bathroom/toilet,good sized and bright room with compresses kitchenette, dining and living zones with a sofa bed, a separate bedroom and a terrace overlooking the pool and garden. To be sold fully furnished and equipped as per photos. REFURBISHED HOME / HOUSE AND LAND, PROPERTY FOR SALE IN SOUTHERN OF BULGARIA! Ecologically clean area, at the foot of the north-western outskirts of Strandja Mountain. Probable drilling for own water source at about 10-12 m depth. In the yard there is a possibility of building a swimming pool. The property is reached via a tree-lined lane, opening into a large gravelled courtyard, which can easily accommodate 6 cars. Close to the house there are semi-formal gardens with herbaceous borders and lawn areas. 25% OFF THE PRICE! 2-BEDROOM APARTMENT FOR SALE IN SUNNY BEACH RESORT,BULGARIA! The complex is located less than 10 minutes walking distance from the wide beach, very close to a bus stop, supermarket, and the first stop of the tourist attraction train that goes around the resort and to the ancient town of Nessebar. There are also air-conditioners installed in each room. The most modern and luxurious complex of the Bulgarian Riviera - Sunny Beach, is located 30 km north of the second largest city on the Black Sea coast – Bourgas. The complex is gated and combines modern facilities and exceptional service. It’s situated about 20min walking distance away from the charming Bulgarian beaches of Sunny Beach- close enough to walk into the centre where all sorts of attractions are, but far enough away to be able to enjoy a quieter atmosphere. LARGE STUDIO APARTMENT FOR SALE IN AHELOY, JUST 5 MIN WALKING TO THE BEACH! The complex is located on the southern coast of Bulgaria in the small resort town of Aheloy. The town is located near the resort of Sunny Beach, Ravda and Nessebar. In just 10 minutes you can drive to Pomorie and 20min drive to Burgas city and International airpot. • Swimming pool 4x8. The 1 bedroom is on ground floor. 4 Bedroom – 3 Bathroom – 1 guest Toilet. Facilities of the Kamares village. Panoramic sea views, Mature Garden. Title Deeds, Stone cladding on boundary walls. • Utility Room. HOUSE / PROPERTY WITH PRIVATE LAND FOR SALE IN BULGARIA,10min DRIVE TO BEACH. BREXIT TO BULGARIA! The village is rapidly developing, houses and yards enjoy constant demand and prices are maintained at a high level. Many families live here year round. One-way Ticket (Local Transport) 0.60 £. 100m TO BEACH! LUXURY STUDIO APARTMENT FOR SALE IN SUNNY BEACH RESORT, BULGARIA. This large, stylish house is located on the outskirts of the small town of Dumbravita near Brasov. A new international airport is at present under construction in Gimbav, which is approx. 20min drive away. Nd floor with total area of 56 m2. It consists of a room which compress kitchen, dining and living area, a separate bedroom, bathroom / toilet and balcony with nice open views over the pool and garden. A STYLISH FURNISH1-Bedroom APARTMENT FOR SALE IN SUNNY BEACH, BULGARIA! The complex is gated and combines modern facilities and exceptional service. It’s situated about 4km away from the charming beaches of Sunny Beach. The unique, picturesque town of Nessebar which is protected by UNESCO is only around 5km away. Choice is up to the new owner. House is on three floors. This house has it's own 50 sq.m. movie theatre. House is bordered with massive fence from all sides. Spacious Garage (Enough space for two cars). A beautiful detached family house at Chuisnes, a small village close to Chartres and at one hour from Paris. The house is very bright by many French doors, 3 only in the living room! (My husband is a creative craftsman/ woodworker and so all works are bespoke including magical high bed in child's room). There is a Bathroom, kitchen/ sitting area and a utility space. New white goods and new cooker. Stable construction stone and brick. A traditional style house stone and brick it has a separate entrance for the first floor and a stone staircase for the second floor. The second floor includes a coridor, a big dining room and two bedrooms. Peacefull village and the house and the plot are surrounded by a fence. A traditional style house with 192 sq.m of living area surronded by 1500 sq.m. plot. - Stable construction stone and brick. First floor consists of a hallway, kitchen, bathroom and two bedrooms. There is permission for a swimming pool. All the work completed so far is of a highly professional standard.